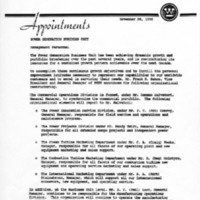 A memorandum from Frank R. Bakos, Vice President and General Manager of Westinghouse Electric Corporation's Power Generation Business Unit (PGBU), regarding recent appointments and the restructuring of the PGBU in 1990. In 1983, the Westinghouse power generation business operation, starting with the Steam Turbine Generator Division, was taking shape in its new Orlando headquarters under the management team led by General Manager Dr. Stan Quick (under E. J. "Gene" Cattabiani, Vice President of the Power Generation Group). This series of letters, memoranda, and charts documents the changes in management leadership at the Orlando site from 1983 through 1998, when the Westinghouse Power Genration Business was acquired by Siemens. Following the announcement of the retirement of Dr. Quick in 1984, the management was led by the team of Bob Ractcliffe and Howard Pierce. In 1987, Tom Campbell was appointed General Manager of the Power Generation Technology Systems Division under Nat Woodsen and Jim Moore, Vice Presidents of the Power Systems Business Unit. In 1988, the Power Generation Business Unit (PGBU) was formed under Frank R. Bakos, Vice President and General Manager (under Executive Vice President Ted Stern), and, in 1995, Randy H. Zwirn took the helm as Vice President and General Manager of the PGBU. He remained at the executive level for 20 years, through the PGBU acquisition by Siemens in 1998 and beyond to 2016. Originally called the Westinghouse Electric Company, George Westinghouse (1846-1914) founded his manufacturing company in Pittsburgh, Pennsylvania, on January 8, 1886. In 1889, he renamed his business The Westinghouse Electric and Manufacturing Company. Westinghouse's primary products include turbines, generators, motors and switchgear related to the generation, transmission, and use of electricity. The company changed its name to Westinghouse Electric Corporation in 1945. In 1981, the company began to relocate its division headquarters for the Steam-Turbine Generator Divisions from Pennsylvania (turbines from Lester and generators from Pittsburgh) to Orlando. The PGBU building was located in The Quadrangle, at 4400 Alafaya Trail. Original 7-page typed memorandum from Frank R. Bakos, November 20, 1990: Private Collection of Harry L. Jaeger. Digital reproduction of original 7-page typed memorandum from Frank R. Bakos, November 20, 1990. Originally created by Frank R. Bakos. Copyright to this resource is held by Siemens and is provided here by RICHES of Central Florida for educational purposes only. Bakos, Frank R.. “Memorandum from Frank R. Bakos (November 20, 1990).” RICHES of Central Florida accessed April 24, 2019, https://richesmi.cah.ucf.edu/omeka/items/show/7447.